The Steven Spielberg/Tom Hanks movie, Bridge of Spies came out last Friday. I am not kidding when I tell you that my honey and I were in the first showing on the first day of it’s release. The Bridge of Spies is an historical reenactment of the US swapping spies with Russia – on a bridge. Our “alleged” spy was a U-2 pilot, Francis Gary Powers. Now at the time, he was hated because there was a way to destroy the plane and he didn’t. There was a way to end his life and he didn’t. As a result, our secret “reconnaissance/spy” plane and its overflight of Russia was now known. Tom Hanks is an incredible actor and Steven Spielberg, a fantastic director. Seeing the movie based on the talent alone is worth it. Hanks plays a lawyer, James Donovan, who defends the Soviet spy in America. This caused major issues with his community and family because America was strongly patriotic and Russia, the enemy. I didn’t know this story and I thought it was interesting. It was presented to show that the “enemy” seemed human. And while the movie showed the disdain that Powers suffered from his own country, it was presented in such a way that you could understand his side. 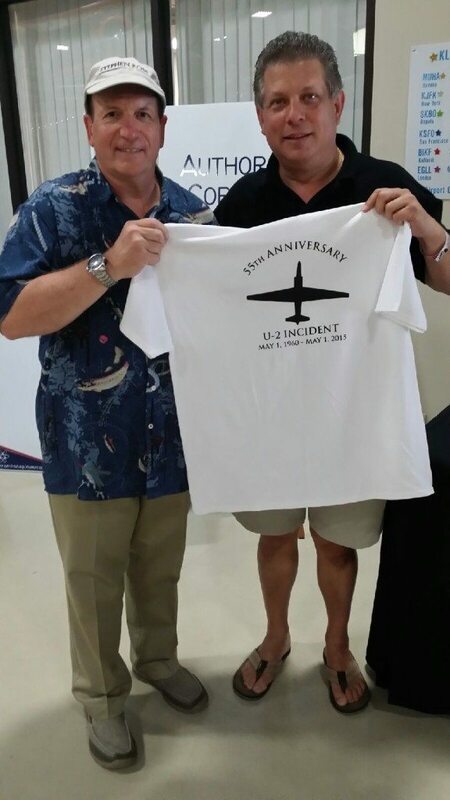 Last April, Sam went to Sun and Fun and met Gary Powers, Jr. As you can see, this year marks the 55th anniversary of the incident (when Francis Gary Powers was shot down). Gary Powers, Jr. is actually in the movie. He is in the hanger during the chalkboard training scene. Look for him. It was through this meeting that Sam found out about the Cold War Museum. The Cold War Museum is located at 7142 Lineweaver Road, Warrenton, VA and if you get a chance, go in and prepare to learn. “Cold War” is very much like a “cold shoulder” and represented the tension after World War II between the US and Russia. 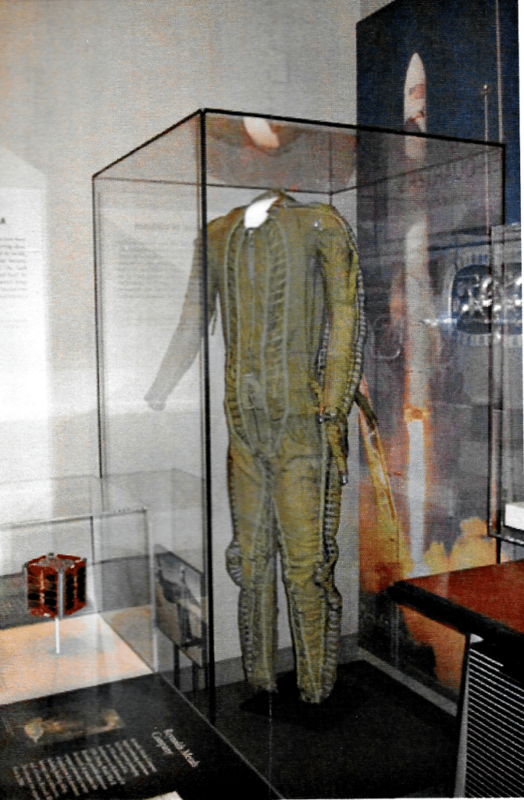 Gary Power’s actual flight suit (a partial pressure suit) is frequently part of a travelling display; and now more during the promotion of Bridge of Spies. Sam loaned two museum’s partial pressure suits; one at the Cold War Museum and one with the Virginia Historical Society. Our very own hometown hero. Sam flew the U-2 in the 80’s and has aquired some memorabilia. He didn’t wear the suits he donated because the technology had greatly improved when he was in the program. But the suits are interesting to see. 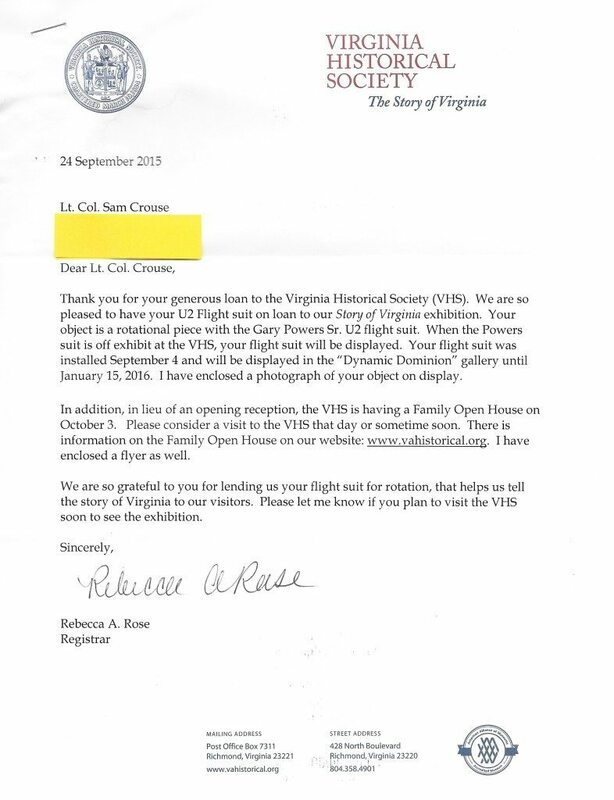 Here is the one in the Virginia Historical Society. To learn more about the U-2 experience, visit Sam’s website here. He is definitely the coolest person I know. Even if you aren’t a history buff, this story is incredible because it is real. It is our history. It is our heritage. It is also a great reminder of the importance of country. It makes you part of something great. It makes me proud and thankful that so many Americans have fought for us. If you run into anyone who has served past or present, please thank them. Let us know in the comments who you are honoring. Thank you for this special tribute. Thank you Sam for your service. I love you! He’s really something. Isn’t he?